National Museum of Azerbaijani Literature named after Nizami Ganjavi of ANAS permanently publishes “Quintuple” (“Risale” (Treatise)– Collection of Researches, “Gaynag” (Source)- Collection of Sources, “Khazina” (Treasury)- Collection of cataloques, “Majlis”(Ceremony) – Collection of ceremonies). One of these collections is “Risale” (Treatise) – Collection of Researchs”. National Museum of Azerbaijani Literature named after Nizami Ganjavi of ANAS realizes two areas. It functions as Museum - the center of culture and Research Institution - the hearth of science. There are scientists of various ages who are the authors of monumental works and youngsters who take the first step towards the science in the Museum. This collection will be the proving ground for their investigations. In the Middle Ages scientific works and treatises were called “Risale” (Treatise). The works created and addressed to us under the title “risale” by our ancestry are of great importance even today. Designating the collection of articles as “Risale” we hope the articles of this collection will become serious scientific facts. 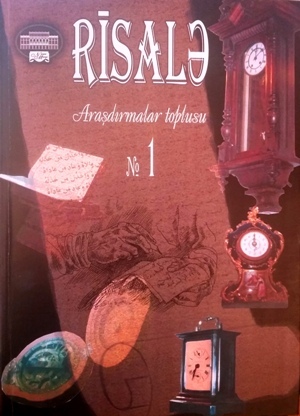 “Risale” (Treatise)– Collection of researches of collaborators of National Museum of Azerbaijani Literature named after Nizami Ganjavi of ANAS is published once a year and occupies the problems of classical and modern literature as well as philosophy, culture and museology according to its content. The articles published in this issue of the collection treat the serious problems of the oldest Azerbaijani literature and culture as well as some actual problems of modern literature and culture from a new perspective.